My last trip to Peb's place, How End, was a disaster with me blanking! Peb's had put me on probation so it was with a little trepidation that I returned to How End to put the records straight. Today was a MFS Champions League match so I was eager for a good result. We would be split across Dani's and Yasi's lakes. The weather over the weekend had been quite warm in London but a cold snap overnight hopefully wouldn't dampen sport today. My neighbours for the day would be 3 Shirts Shedders and Colbrad. I was also in a split section across Yasi's and Dani's for CL points... Not the best, but you take your lot. 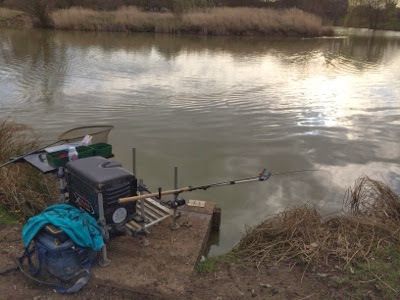 We had the choice of either Gold Valley or fishing the large lake, otherwise known as "Top Lake" at Lake John Fisheries and opted to head out to Waltham Abbey. Lake John opens quite early and we arrived at 7:30am. It was a lovely day with some gusting breeze that was giving the water a good ripple. As we were 1 all in the mini competition a coin was tossed to decide who has the choice of swims, Mark won. Walking round to the left handside of the lake Mark picked Peg 34 which had a chuck to the island, so my choice was either a peg which only had open water (Peg 33) or chuck to the large overhanging willow (Peg 35). I chose the Willow peg. 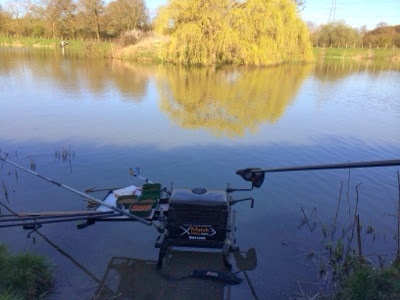 The reports from Lake John mention good silvers sport together with some larger carp so my attack would be two pronged with a feeder line to the over hanging Willow and a Pole line at the base of the near shelf which was about 8 metres out. Bait for the day: Maggots, Pellets and Sweetcorn. Almost a year to the day since Mark and I fished at Chestnut Pool in Biggleswade. The weather last year was quite different to the day that greeted us today. Lucky for me that Mark called me at 6:15am as I had overslept and ended up getting to the fishery 30 minutes late to a full car park! Mark had picked Peg 15 and left Peg 14 for me with a great island chuck. Graham was also with us just round the corner on Peg 17. I decided I wanted to keep things simple today and given the better weather and increased temperature opted for a method feeder rod using dampened 4mm pellets and either an 8mm or 11mm pellet banded. I was set up in no time at all. We called the all-in, my first cast after I'd clipped up a couple of feet from the island was shorter than the line clip so not to spook any fish out of my swim and around the island. With the MFS Stafford Moor Silvers festival over for another year there is always an optional MFS Champion's league match on the Friday. Today Carp counted and plenty had shown during the week so I was looking forward to winding down a fun week with an easy day. 20 of us were fishing across Tanners and Woodpeckers. Getting to the peg it was a very simple choice for me. Today would be a bomb and pellet approach. I also tackled up a pellet waggler rod, just in case the carp were showing at shallower depths. Bait was banded 8mm and 11mm pellet. The final day of the festival and another late night in the Lodge of Plenty with some describing it at similar to a football crowd! Col cooked up some monster Pork chops which went down very well. Andy G and Chris Martin provided most of the nights entertainment especially with the stories of the local curry house… no more need to be said on that one. Today would be an open draw, all three lakes in the bag. I didn’t want to revisit yesterday by being on Tanners. Peg 20 on Pines came out of the hat. This was a new peg not previously fished in the festival so I didn’t have anyone who had fished it previously. Thoughts of an early night at the Lodge of Plenty didn’t happen… Dinner last night was Chilli Con Carne which Animal described as a waste of good beef and the lack of garlic bread was noted! Mind you, Animal was claiming he hadn’t had seconds all week yet he proceeded to warm up the curry from the previous night and scoff it as ‘main’. The Chilli was lovely Col! 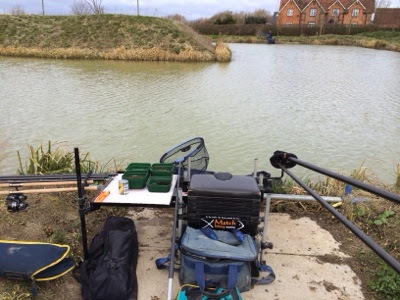 Today we would be fishing Tanners lake, some decent weights were coming from the high peg numbers, but the low peg numbers weren’t fairing so well. We all knew where we wanted to draw. I grabbed a couple of Drake handmade wagglers as I would be breaking the rods out today. Out of the draw bag came peg 13… not where I wanted to be, but its the luck of the draw. The weather was quite calm in the morning so I opted for a 13 metre pole line straight ahead and at 2o’clock. Day 2 of the festival and the weather this morning looked like it would be a nice day. The Lodge of Plenty hosted most of the lads last night, although I managed to get to bed just after midnight. Col cooked up a cracking lamb curry. Andy G provided the entertainment as per usual with his impressions of everyone and trying most of the drinks on the table! I would be fishing Woodpeckers today which had fished hard yesterday. Getting to the draw I pulled out Peg 16, a very easy walk from the car park. Col, aka Billy No Fish (BNF) pulled out 12 meaning he would be next to me and I had a chance of getting my second red shirt! Other lads in the same section were Herbie, Jamie (ASBO Twin) and Kenfish. My 3rd year at one of the festivals of the season. I arrived in Devon the night before and was greeted by the motley crew at the lodge of plenty, namely Col, Paul (Animal), Paul (No Hope) and Shedders. It had been a tough weekend of a birthday and flat warming party and this week would just serve to top up the hang over’s. A beer was quickly dispatched and many of the other Stafford Moor festival goers turned up to the lodge of plenty. A long night ensued, late to bed and early to rise… Col dished out our normal full english breakfast which would see us right for the day and we headed Andy Seery’s shop for the draw. The normal pushing and shoving in the shop was occurring. Herbie, Andy and Chris were sorting all the monies, pegs and rules out, although we still cannot understand Herbie’s local yokel accent!